1. Fry Rava with 2tbsp of ghee,till aroma leave out on medium flame(Don't over fry) and keep it aside. 2. Add 1 tbsp ghee fry raisins and cashewnut and keep it aside. 5. Then add pineapple cubes,or grated pineapple, fried rava stir it once and let it cook till water is absorbed and rava leaves the walls of Pan. 6. 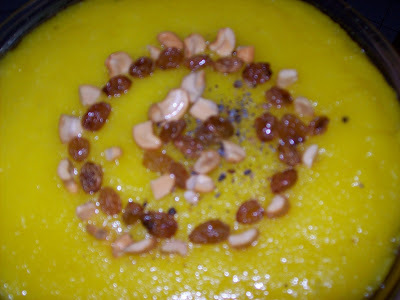 Add ghee and Pineapple essences, cardamom powder stir it and garnish with cashew &raisins Serve hot or cold. 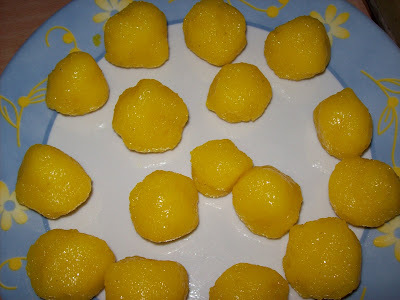 This pineapple jamun I learned it from sumascuisine. I loved the recipe.. I tried and tasted very yummy. 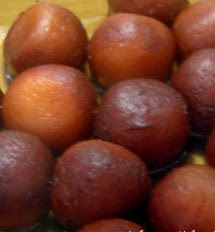 I prepared jamuns as per her method but I didn't add milk. In a pan cook chopped pineapple with 2 cups of water till tender. Later add water and let it come to boil at which point rava is added gradually. Keep stirring and take care not to form any lumps. Simmer and let it cook for 5 min. Once rava is cooked, add the sugar and mix it well till sugar dissolves. After that set the mixture to cool. For the sugar syrup, drop sugar and water in a pan and cook to make syrup. Add cardamom powder. Boil till the sugar turns to one threaded consistency. Transfer the syrup into serving dish. Later knead the pineapple rava mixture into soft dough. Divide the dough into small balls. Later knead the pineapple rava mixture into soft dough. Divide the dough into small ball. Deep fry these in hot oil on low heat. When jamuns are golden brown, drain them and add to the hot syrup. Suma from Suma's cuisine has passed on the YUMMY BLOG AWARD and this is my first award.Thank you Dear Suma ..
"Yummy blog award is the award given to the blog with most yummy recipes/photos". U r rocking with pinaple!! !